I have a large bag of chia seeds and had yet to use them. I've thought of making a pudding several times but worried that I may not like it. I honestly can't explain why I thought might not. If I can get the pudding to taste like ice cream, I'm sure it would be amazing. Thankfully, the idea of using them in a muffin came to me. 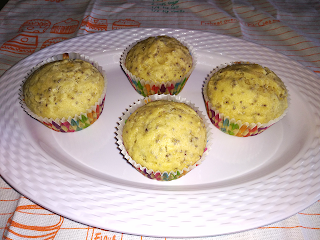 The orange and almond in the muffins are great and the chia seeds add a little crunch. So one chia seeds recipe down and hopefully more to come. Below the recipe you'll see the other muffins the bakers made this month. Preheat oven to 425F. Line a cupcake tin. Rub the orange zest into the sugar for a few minutes. Add flour, chia seeds, baking powder, salt. Whisk to combine. In another bowl combine egg, milk, orange juice, oil, and almond extract. Add the wet ingredients to the dry ingredients and stir gently until just combined. Fill each muffin well almost full. Bake 5 minutes then lower the oven to 350F. 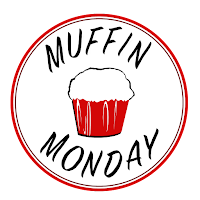 Continue baking another 10 minutes or until a toothpick inserted into a muffin comes out clean.